Boots at The Liberty has been named ‘Retailer of the Year’ at the centre’s annual ‘Retailer Awards’ ceremony. 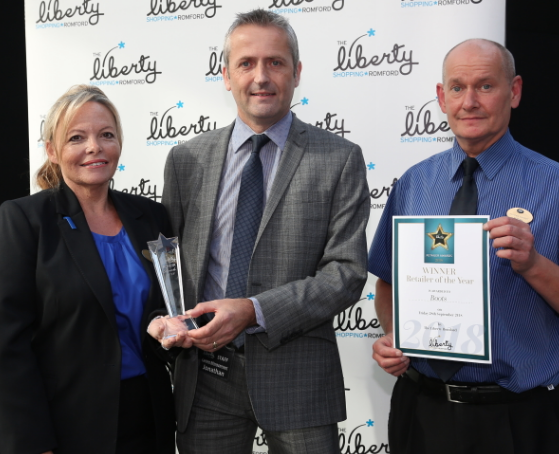 The Liberty honoured the town’s favourite shops at the annual awards event, which took place at the centre on Friday 28th September. Teams from the shopping centre’s 100+ shops waited in anticipation for the winners of the coveted awards to be revealed. The ‘Best Customer Service’ prize was awarded to Lush, while River Island was honored for its spectacular visual merchandising, winning the ‘Best Window Display’ award. Super Sushi was named this year’s ‘Best Independent Retailer’ and Vediya Mehmet from The Works was awarded the ‘Sales Person Of The Year’ award. Belinda Prichard, Manager at Boots commented: “We are chuffed to bits to be awarded retailer of the year, the competition here at The Liberty looked very strong for 2018. Winner of the “Sales Person Of The Year” award Vediya Mehmet from The Works added: “It was a huge surprise to win the award last week. Centre Manager, Jonathan Poole, said: “It was great to welcome both our retailers and shoppers to celebrate the achievements of both stores and individuals.